Ready to embark on a first time Disney Cruise? 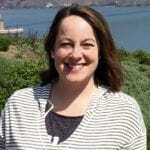 Happily we TravelingMoms have been on our fair share of cruises and feel a bit like Captain Jack with his trusty compass at home on the seven seas. Landlubbers cruisers for the very first time may feel like they don’t have their sea legs yet when it comes to planning and preparing. We love to share our travel tips and tricks, especially Disney cruise advice for first time cruisers. So here’s everything you need to know if you are new to Disney cruising. 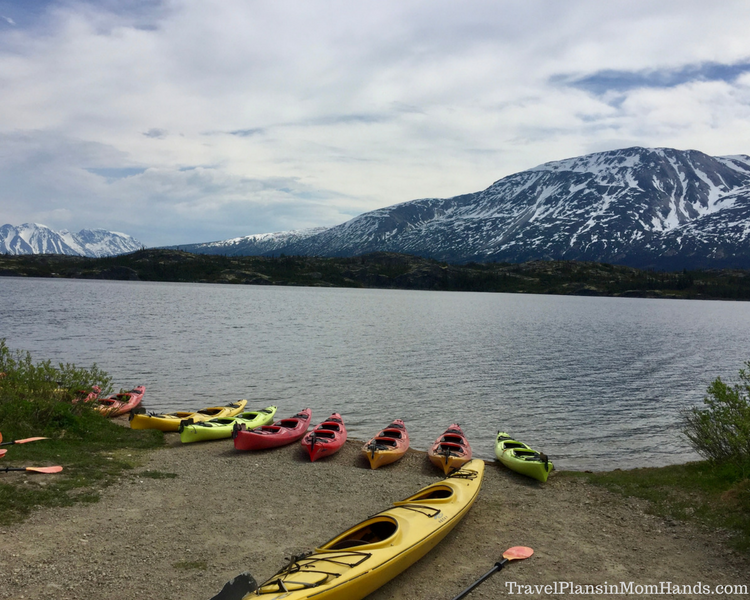 Kayaking on our Alaska cruise on the Disney Wonder was a definite highlight, and all because we could arrange our Port Adventures in advance of our Disney cruise. Photo by TravelingMom with Teens Sherry Boswell. 2. The entertainment will blow you away. 3. Plenty for grownups to do, so get away from the kids! 4. Keeping up with the veteran cruisers. 5. Extras add the pixie dust! 6. What you must do on or before the last day. “Yo ho, yo ho a pirate’s life for me!” Well, if I changed the word “pirate” to “cruiser” then I’m IN! I am a huge fan of cruising, specifically on Disney Cruise Line. I’m in good company. In fact, many of the TravelingMoms have swashbuckled our way around the Caribbean and beyond with our families. I remember my maiden voyage, and it seems to have a common denominator with other first-timers’ experiences: I didn’t have a clue on many of the ins and outs of sailing with Disney. So here are 6 insider tips to make the most of a first timer cruise with Disney Cruise Line. 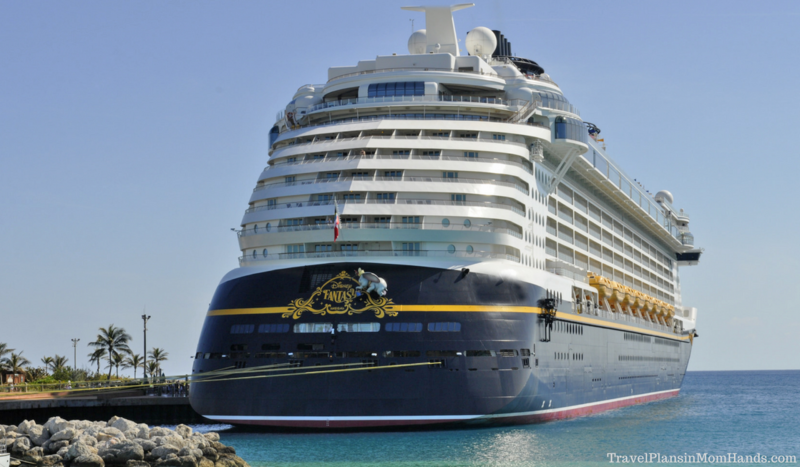 A Disney cruise is the opposite end of the spectrum from a Walt Disney World vacation. Relaxation and chilling out replace the “Move It, Shake It, Dance and Play It” theme park pace. Replace park hopping with island hopping, FastPasses with food and wine classes, and parades with Castaway Cay wearing your shades. So when planning for the cruise, the major decisions are: When to dine: early or late seating? What category stateroom? And what excursions sound appealing? Fortunately, all that legwork can be done ahead of time. Did you know that beverage seminars and kids’ club registration can be done in advance on the Disney Cruise Line website? Less time waiting in line means more around the ship time! Finally, since many Disney cruises sail in the Caribbean and include Disney’s private island, Castaway Cay as one of the ports, I’d suggest doing your homework on what activities and excursions are available there. 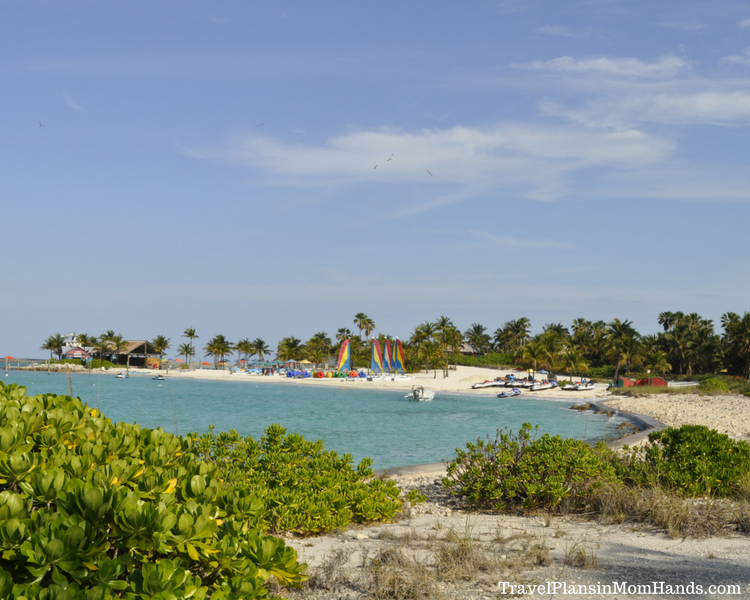 For your first trip to Castaway Cay, you may want to simply enjoy the island. On our Disney Fantasy sailing, we chose the snorkel, tube and bike package. For the entire day, you have access to each of these. We bounced from our beach home base to get some exercise and explore the island while biking, followed by the less strenuous tubing and snorkeling. Hello, gorgeous Castaway Cay!This playground awaits on many Disney cruises, so get ready by knowing what you’d like to do (or not do-like relax in a hammock or beach chair all day). Photo by Sherry Boswell, TravelingMom with Teens. One of the most tangible tips I can offer is to stay on top of all the ship’s activities by downloading the Disney Cruise Line Navigator app. Alternatively, a paper copy of the Personal Navigator is delivered every night outlining the following day’s offerings for those who like to kick it old school. From special deck parties, fireworks, food and beverage seminars, character greets, and ship tours, the Personal Navigator outlines the day’s activities hour by hour. One of our family favorites is the all-you-can-watch Disney first run movies airing in the Buena Vista Theater. Plan your evenings around the Broadway-caliber shows like the ever popular Frozen: A Musical Spectacular showing on the Disney Wonder or Beauty and the Beast on the Disney Dream. Additionally, Disney Cruise Line offers special sailings like the Marvel Day at Sea, Star Wars Day at Sea, Halloween on the High Seas and Very Merrytime Cruises. 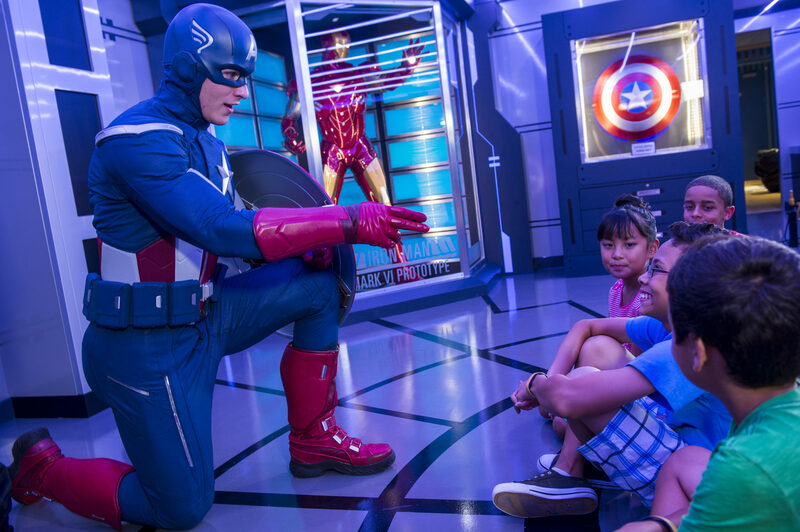 We’ve done all but the Very Merrytime one, and each adds an extra layer of fun to the cruise experience, especially for Marvel and Star Wars fans. 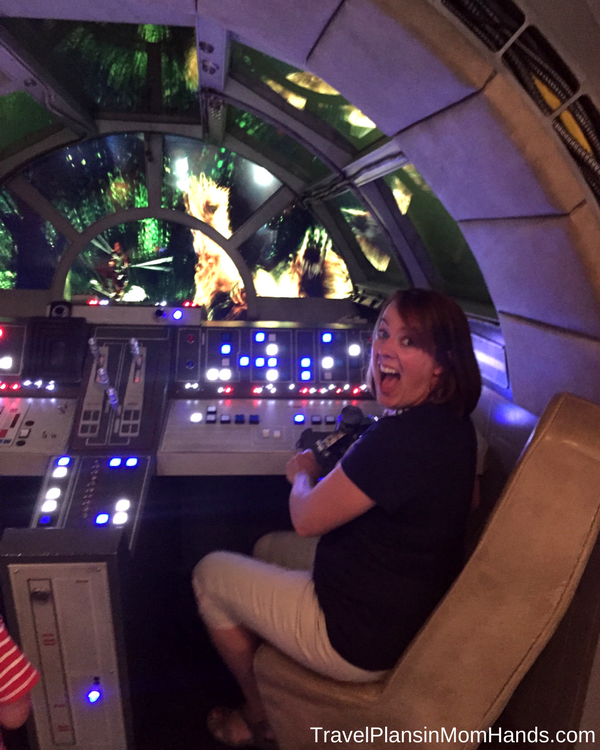 TravelingMom Disney Cruise Tip: Channel your inner Chewbacca and fly the Millennium Falcon in the Oceaneer Club on the Disney Dream. But be advised that grown-ups are only permitted in kids’ clubs during Open House hours. Go figure, they want to play Star Wars without us! Geeking out at the chance to fly the Millennium Falcon in the Oceaneer Club (kids club) on the Disney Dream. Photo by TravelingMom with Teens Sherry Boswell. Palo and Remy are two adults-only dining options onboard Disney Cruise Line ships. Remy is fine French dining onboard the Disney Dream and Disney Fantasy, and Palo is Northern Italian cuisine on all four Disney ships. Why pay the extra $55 per person for Palo or $85 per person for Remy? Because it is a culinary experience and gosh darn it, you’re worth it! Actually, this may not be for everyone, but for those who really love outstanding food, impeccable service and a dining experience, reserving one of these fine dining experiences for brunch or dinner is a MUST. TravelingMom Tip: One more little nugget of information regarding reservations, Disney Cruise Line holds back a number of reservations for the adults-only Palo and Remy restaurants, so don’t get frustrated if unable to snag a reservation in advance. 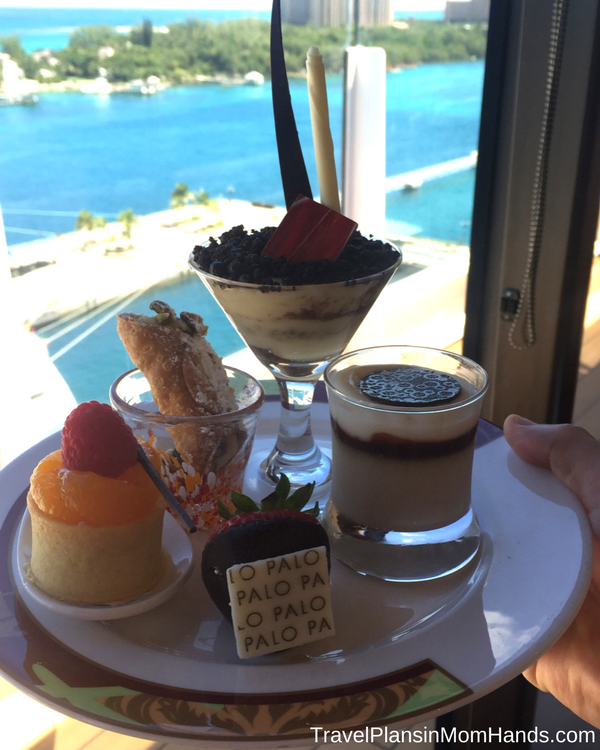 Palo brunch has both a la carte menu and a buffet featuring scrumptious desserts and views for days. Photo by Sherry Boswell, TravelingMom with Teens. Each Disney cruise ship has different lounges aka grownups playgrounds. One of my favorite pre or post dinner spots was lounging in the Cadillac Lounge on the Disney Wonder and listening to smooth tunes. TravelingMom Tip: Try the Pink Cadillac, a concoction of Ciroc coconut, watermelon liquor, and Moet Ice, and served with a macaron. Perfection! Go tour the Senses Spa during Open House and you could win a treatment, book a special spa package at a significant discount, or snag one of the coveted Rain Forest passes for either a day or length of cruise. The Rain Forest pass at Senses Spa was my guilty pleasure and my best onboard purchase by far. Picture scented showers, sauna rooms, private jacuzzi, and the coveted warm loungers in an area off limits to other spa patrons. Totally the VIP treatment and yet someplace that first time cruisers seldom know about in advance. When on a Disney cruise, one of the best deals is a mixology or a tasting class: only $ 20 per person! From making your own mixed drinks to tastings focused on specific beverages, there is something for everyone’s preference. Register on the Disney Cruise Line website in advance, so be sure to do that because they will fill up fast! 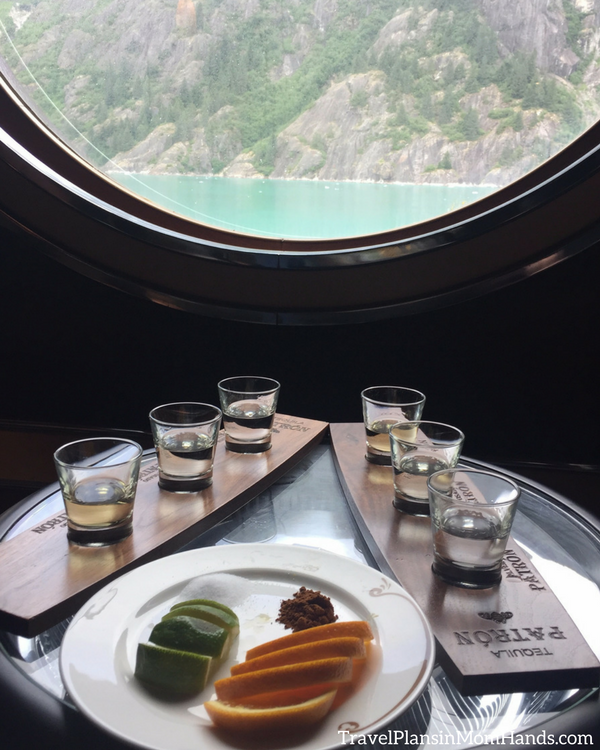 Beverage seminars like this tequila tasting on the Disney Wonder fill up fast, so pre-book them on the DCL website. Photo by TravelingMom with Teens Sherry Boswell. As a newbie cruiser, jump all over the reservations for the booking window for Port Adventures, spa and salon services for adults 18 and older, and select Character Greetings. The advance booking window for first-time cruisers is 75 days prior to sailing, so mark your calendar! That being said, don’t be deterred if unable to book something ahead of time. The prime time to check on adult dining, spa services, dining inquiries about your rotation and seating, and Port Adventures is immediately upon boarding the ship. First-time cruisers usually are unaware that they can request seating at dinner for their party. While we’ve tried dining both at our own private table and sharing with another family, I must admit it was an unexpected gift to be able to meet another family and bond with them over the course of the cruise. 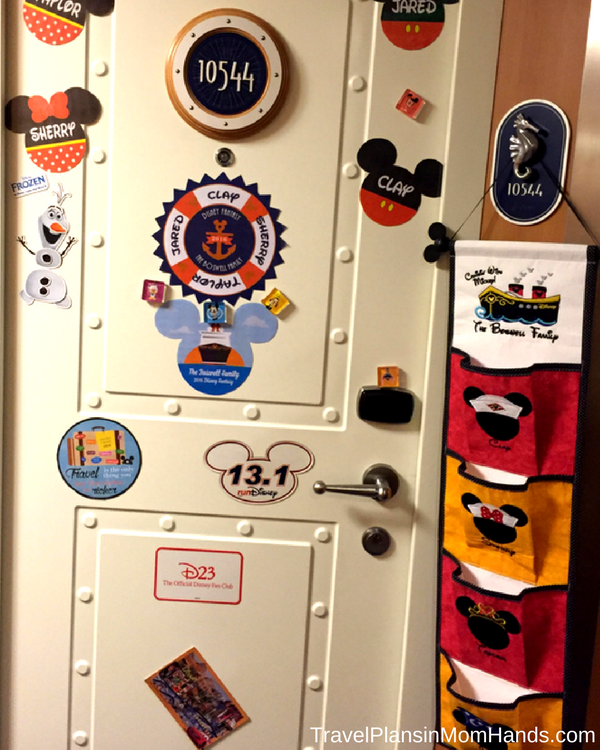 What better way to get in the spirit of a first-time cruise than to decorate the stateroom door with magnets! From Mickey ears with names of family members to cruises sailed, magnets add the pixie dust like Tinkerbell helps the Darlings to fly in Peter Pan! We even have a TravelingMom tutorial on how to make them with templates! We love the magnets because they are festive and helps us find our cabin. Another fabulous way to get to know fellow cruisers beforehand and learn your way around the ship is to participate in a fish extender group. A fish extender is a hanging set of pouches/pockets hung outside your stateroom. Decorated with names and often Disney characters, the fish extender holds the various surprises that other families leave for you. Magnets and fish extenders are 2 fun ways to let the pixie dust fly on a Disney cruise. Photo by Sherry Boswell, TravelingMom with Teens. Prior to sailing, groups are organized and share ages of kids, interests, and allergies. Although these groups are not coordinated or sanctioned by Disney Cruise Line, they are an excellent way to get to know others on your cruise and learn your way around the ship as you make your special deliveries. Pros of fish extender: get to know other families before cruising; fun to get surprises during the cruise; learn way around ship by delivering gifts to others. Cons: usually requires additional luggage to make space for gifts; may be added pressure for a first time cruiser. My advice: try it if it sounds fun; otherwise, sit back and relax, observe how it works, and save it for another cruise. I’m talking all you can eat ice cream machines at Eye Scream on pool decks (Deck 9 on Disney Magic and Wonder and Deck 11 on Disney Dream and Fantasy). As for room service: order milk and cookies every night at no extra charge (but please tip). And my favorite dessert is the Grand Marnier Souffle, which can be had at Triton’s on the Disney Wonder, Lumiere’s on the Disney Magic, Royal Palace on the Disney Dream and Royal Court on the Disney Fantasy. Avoid the last day blues by booking a placeholder for a future Disney cruise. That’s the only way to leave the ship smiling (and save money). Photo by TravelingMom with Teens Sherry Boswell. Here’s the secret on how to leave the ship with a smile on your face: book a placeholder for your next Disney cruise! Stop by the Future Cruise Desk and either arrange your next cruise or get a placeholder for one. I like the placeholder option because it’s only $ 250 and it saves you 10% off your future final cruise fare. Plus, you also earn you up to a $ 200 onboard credit ($100 for 3-6 night cruises, $200 for 7+ night cruises). Booking the placeholder must be done before you disembark, and I would suggest NOT waiting until the last day of your cruise because that office gets pretty busy. Bonus: up to two staterooms per household can be reserved. Okay, mateys, now captain’s orders are to go enjoy your cruise and come back and tell us about it in the comments! And be sure to check out our Disney Cruise landing page for more tips and tricks.